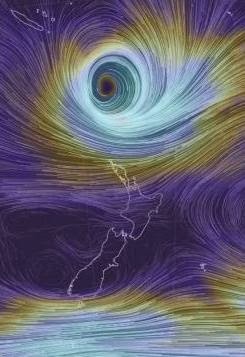 New Zealand first began tracking cyclone Lusi about a week out from this years Tarawera Ultra Marathon. Our Met service had forecast it hitting on the Saturday, the day of the 60, 85 and 100KM trail run but at no stage was I the slightest bit concerned given their appalling track record. 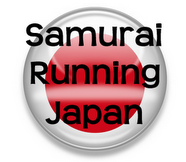 Sage Canaday and a host of the world’s elite ultra runners need not panic. The day was bound to dawn balmy and clear. My good friend Masahiro, his wife Kumi and their daughter Majuri arrived in New Zealand from Japan on the Wednesday. It’d been 10 years since I last saw him here and at that time he was running the length of our North Island. Not sure why, buts that’s Masahiro for you. He and I became friends’ back in 1996 when he, a little overweight and I, a two pack a day smoker, decided to make a lifestyle change for the better. We still joke today about those first few 4KM runs that were always capped off with a meat lovers pizza, a coke and a couple of Seven Star cigarettes. Sage Canaday is someone I like to follow for a number of reasons. Firstly he is one fantastic marathon/ultra runner. Secondly, he’s a great communicator who has a heap of online training videos and a blog freely available. Lastly, the guy seems like a truly down to earth ‘good bloke’. 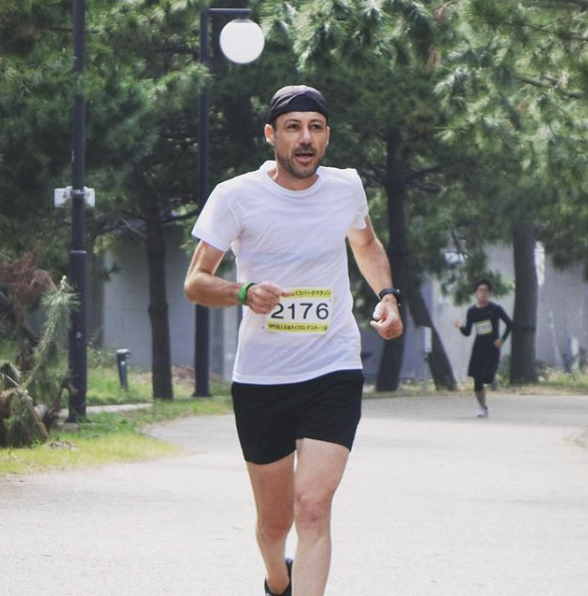 This year he returned to defend his 100KM title and I was determined to be there at the finish to cheer him home a little, or a lot before Masahiro. The bloody Met service finally predicted something of note almost to the hour! We’ll never hear the end of it! Lusi was literally just over the hill as runners assembled at the start line. Organisers fearing her wrath decided to shorten the event to 59 and 69KM. Excitement still filled the air as the thought of battling something extra and potentially monumental sunk in. 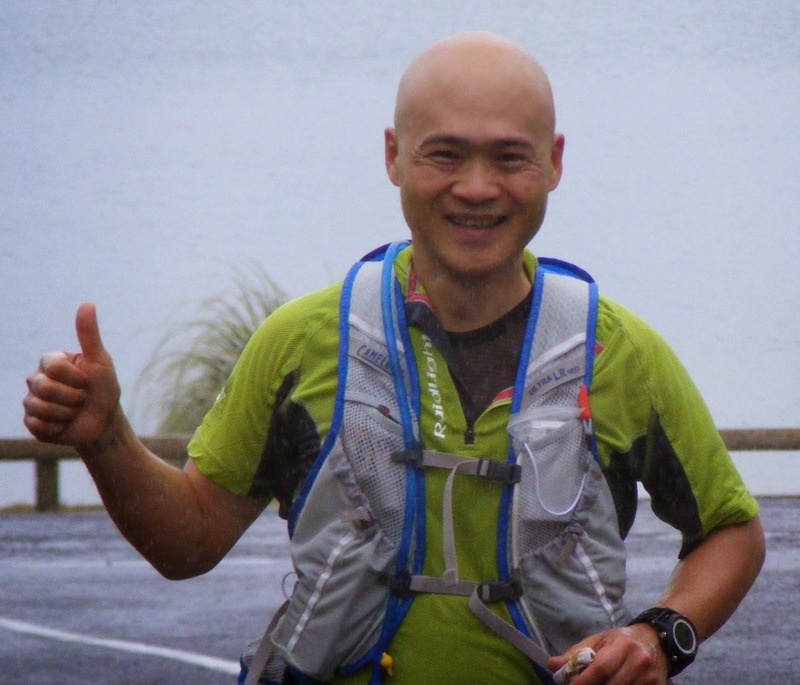 Having made my 12, 24 and 34KM rendezvous points to support Masahiro I made a mad dash for the finish line. Once there we were told over the intercom that Sage was a good 20 minutes ahead. Given the relatively low supporter turnout due to the horrible weather, I sensed an opportunity. With a couple of minutes to spare I cunningly maneuvered myself between a TV ONE NEWS camera man and a local newspaper reporter in a roped off area behind the line. Armed with my $200 bargain basement portable Fuji automatic camera, I must have fitted in perfectly. And all of a sudden there he was. Arms aloft and literally two feet away as I clicked the auto button feverously. Then without thinking and straight after the race director had given Sage a celebratory hug I stepped forward, extended my hand and said "Congratulations Sage, awesome run" or something like that, and while shaking my hand he replied with "thanks man" or something like that too. My wife who has a rather unsettling crush on him, has insisted I don’t wash my hand for the foreseeable future. For many, Masahiro included, the day wouldn’t finish at that line. Lusi strengthened in intensity as the day wore on and many runners were pulled from the course before dark. My friend didn’t mind though. He’d conquered the majority of it on a day that he and I will never forget. That’s surely a memory worth cherishing. Thanks Masahiro and Sage – two genuinely nice guys. 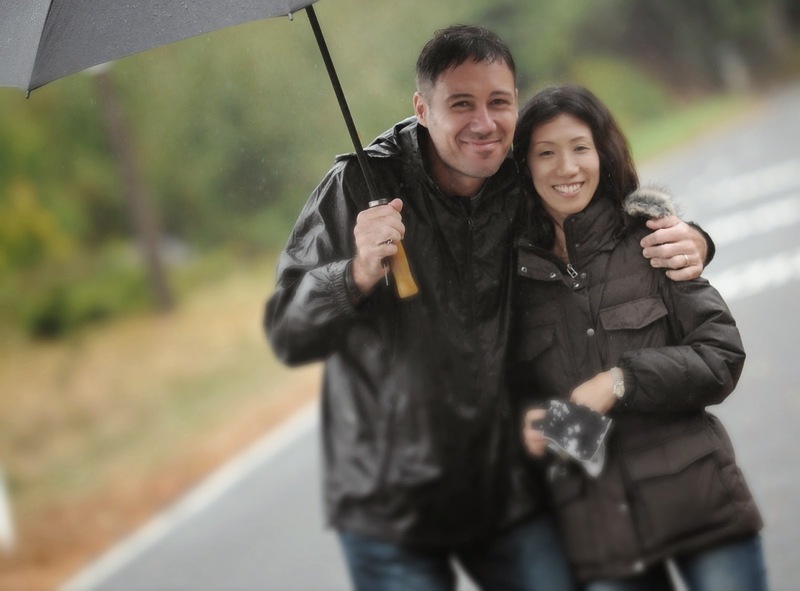 Thanks also to Allan Ure the camera guy for taking a shot of two dedicated supporters on the day. Cool. That would be awesome to meet/talk with him. I agree with your wife in that I have man-crush on him as well. Should I be concerned that my wife now wants me to grow my hair, loose a few pounds and run faster? Sage is the best ambassador the sport has. No doubt about it. Oh yes, wash your hand! You'll be pleased to hear he is a dedicated HOKA man. Was wearing a HOKA ONE ONE Huaka pre-release pair for the Ultra. Swears by them. He apparently ran a 2.22 marathon in the same pair a couple of weeks earlier. Google: 'hoka huaka sage' under the video tab and you'll see his review. 7.37 minutes long. PS I would if she would just let go!